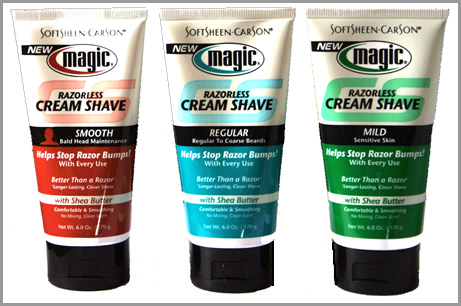 SoftSheen Carson Magic Razorless Cream Shave is proven to help stop razor bumps from forming with every use. Put down the razor and improve your look with this improved comfortable and smoothing formula! AN EXCELLENT CREAM THAT WORK'S WELL ON THE BODY, DO NOT USE ON THE FACE BUT DO USE IT ALL OVER THE REST OF THE BODY AND YOU GET EXCELLENT RESULTS. SO STOCK UP SO YOU HAVE LOT'S OF IT.